The Red-winged Blackbird always reminds us of Halloween. 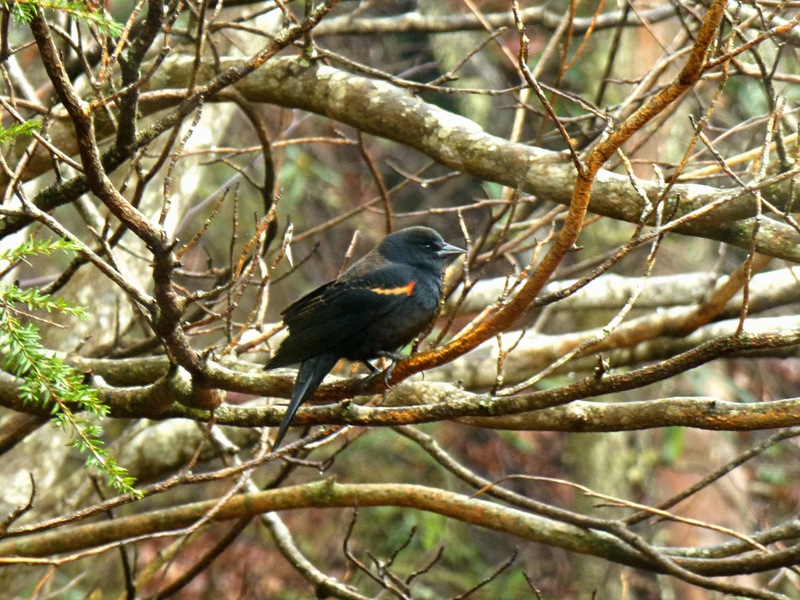 Not sure if it’s because it’s a blackbird or because it has a splash or orangey-red on its wings, but at any rate, we’ve chosen the Red-winged Blackbird as our October 2015 bird in our 12 Months of Birding at the Inn series on the blog. Red-winged Blackbirds are considered year-round residents of our area, but we don’t see them very often. They mostly prefer watery spots like marshes in the spring and summer, and like meadows, crop fields and pastures in fall and winter. Also telephone poles, according to the Cornell Lab of Ornithology. The crop fields and pastures thing makes us think that they’re in abundance south of Old Fort on farmland around Painter’s Greenhouse or near the the farm at Warren Wilson College west of Black Mountain, which also conveniently borders a waterway, the Swannanoa River.. and by the way, Warren Wilson really is as beautiful as the pictures. Red-winged Blackbirds do get around (migrate) a little bit, and come to visit the Inn on Mill Creek B&B from time to time. The one pictured above was photographed in November of 2013. Male Red-winged Blackbirds are pretty easy to spot, black overall with a red and yellow block on their shoulder. They can puff the colored feathers up to make the color block look larger, too. Females are a streaky brown overall, with a pale orange or buff-colored throat. The females almost remind us of a Song Sparrow. 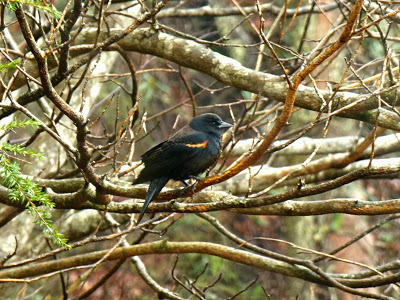 This entry was posted in Birding in the North Carolina Mountains, Wildlife and tagged 12 Months of Birding at the Inn, autumn, birding by Inn on Mill Creek. Bookmark the permalink.